Happy to team up with the folks over at Double R. Ranch for the following post. Check them out! The man’s man – a country man. That’s how most people typically refer to Matt Moore. After all, his book Have Her Over for Dinner; a gentleman’s guide to classic, simple meals taught men all across the country how to wow a lovely lady with a home cooked meal. However, Moore definitely knows a thing or two outside of the kitchen. A Nashville based country music singer/songwriter, and also the creator/owner of the popular gentlemen’s cologne line, Moonshine, Moore is the quintessential Modern Man. The proud history and lineage of Double R. Ranch Co. embodies the independent, bold, and manly spirit of the man’s man – Moore, along with Double R. Ranch Co., is proud to offer up ten must-haves to help men everywhere become a Modern Man. Cast Iron skillet – Heavy, durable, and inexpensive – cast iron skillets retain even heat while blackening, roasting, simmering, or sautéing. The best part? It lasts a lifetime. Your grandkids will fight over it when you’re dead. Go-to Steakhouse Recipe to Impress – Forget about splurging at the steakhouse. 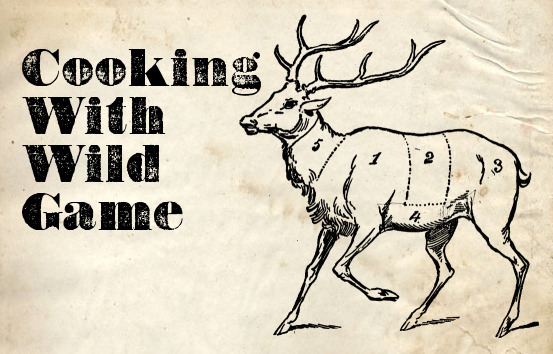 Be a man – learn how to cook killer steaks at home. Purchase a quality cut of steak, such as Double R. Ranch Co.’s Steakhouse Filet. Hint: your meal will only be as good as your ingredients, so don’t skimp on your beef. Heat your seasoned cast iron skillet over medium high heat until it’s hot. Liberally season the filets on both sides with kosher salt and fresh cracked pepper. Next, sear the filets in the skillet for 3 – 4 minutes on each side (Don’t touch it! Allow the meat to cook undisturbed to create a nice sear, i.e. flavor). For thicker cuts, place the steak into a preheated oven at 350 degrees to finish cooking – until internal temperature reaches 135 degrees F for medium rare. Remove steaks from heat, place on a cutting board and tent with foil – resting for 5 or so minutes to allow the juices to redistribute. Serve. Bottle of Cabernet Sauvignon – Bold, rich flavors with lush fruit aromas and spice. A crowd pleasing bottle of wine pairs perfectly with a quality steak – and of course, that intriguing brunette on your arm. Firm handshake – A man is only as good as his words. A man’s words are built on trust. Trust is earned with a firm handshake and a square look in the eye. Dark sports coat – Casual with a pair of dark jeans, or dressed up with a pair of slacks – every man should keep a well-tailored, pressed sports coat on hand to arrive fashionably at any occasion. Pocketknife – You’ll never know how bad you needed one of these things until you start carrying one every day. From opening letters, to ‘trimming’ the fat – a dependable pocketknife is the real men’s ‘accessory’. Cologne – Smell like a man. Find a scent that avoids celebrity endorsements or frail models to push sales. Instead, stick with woodsy notes of musk, spice, and leather to make your inherent manliness smell even better. Pair of Boots – Think more along the lines of John Wayne than Urban Cowboy. A sturdy pair of boots will last years and never go out of style. Whether riding a motorcycle, working in a vineyard, or even dressed up under a pair of slacks – this classic look evokes a ‘timeless man’ with a touch of attitude. Personalized stationary – Stop writing emails and texting. Make a memorable impression by sending hand written notes on card stock paper with your full name in letterpress at the top. Trust us – they will never delete you out of their ‘inbox’. I've spent quite a bit of time touting the merits of momma's cooking on my blog. After all, I owe most of my culinary knowledge, interest, and experience to her. Better yet, her influence has had a much greater reach than just me. She's also rubbed off on my beautiful sister as well. I spent the night at my sister's house last Friday after a long drive into Atlanta. Pretty much exhausted, I was greeted with plenty of wine, beer, and conversation upon my arrival. To put it bluntly, Friday night stays at her house often end up in a 'black hole' evening of drinking, dancing, and eating. Once the music is on - forget about it. Good times. But sis had one more trick up her sleeve. 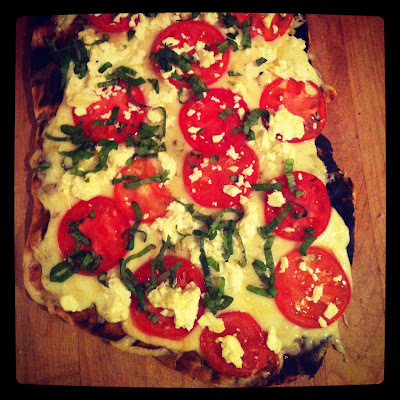 A delicious take on grilled pizza that perfectly suited our penchant for late-night eats. She's always been great at finding new delectable recipes - whether from the pages of Southern Living or from a friend - and making them her own. She's crafty like that. This one was absolutely delicious - and I really loved the use of garlic butter in place of a traditional tomato sauce. Good work sis - and the end result turned out just as beautiful as you! Preheat one side of a grill over direct heat. Meanwhile, roll out the pizza dough as thin as possible (less than 1/8 inch) and coat in olive oil. Melt butter and garlic together in a microwave for 45 - 60 seconds. When grill is ready, carefully stretch the dough over the grate and grill for 60 - 90 seconds - the dough will puff up and bubble. Flip dough and move to indirect heat. Brush dough with garlic butter and top with remaining ingredients. Cover grill, and continue to cook pizza over indirect heat until cheese is melted; 10 - 15 minutes. Remove from heat, slice, and serve. 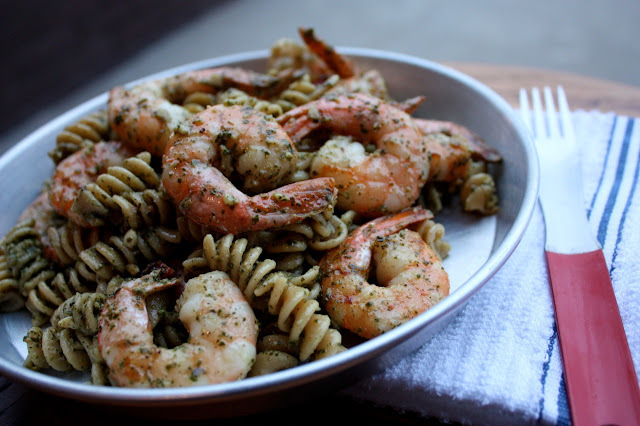 Last week, I came clean on taking a kitchen shortcut by utilizing store bought pesto to create my killer pesto + shrimp pasta (see prior post below). Based on your overwhelmingly positive responses, it seems that taking my shortcut wasn't such a bad thing after all. Well, I had some pesto leftover, and you know how I feel about eating the same thing two days in a row. Hmm, what to do. Inspired from a sandwich I once had at PEI's Casa Mia Cafe, I took matters into my own hands - Southern style. You see, we Southerners certainly love our pork. Whether it's in the form of bacon, belly, chop, loin, or pulled - it truly is the 'meat of the gods'. That's why I always keep a hock of salt cured country ham in my fridge. Whether to serve hot off the griddle, or as a base in stocks, greens, or risotto's - it's one of my favorite 'go-to' ingredients. Of course, when it came time for a 'breakfast on the go' - I started perusing my fridge and pantry for anything I could find. A ciabatta roll, a few eggs, a slice of ham, some sharp Wisconsin white cheddar, and . 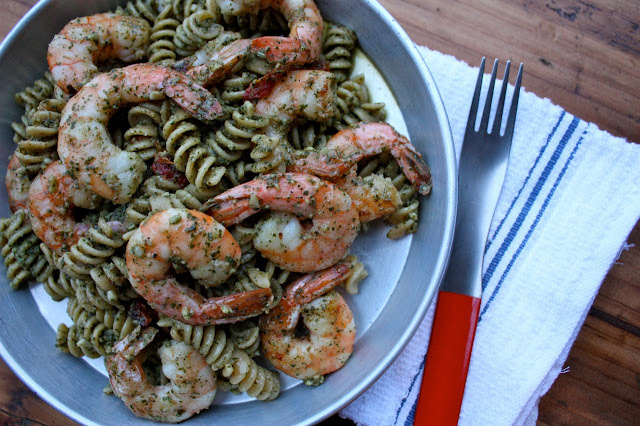 . . you guessed it - that leftover pesto! My creation, served hot and wrapped up in parchment paper was the perfect way to start a 6 hour road trip to visit family in MS.
Take note that I prefer not to melt the cheese prior to assembling this sandwich. Instead, I find that sliced thin, and just slightly melted from the heat of the toasted bun, this cheese really pushes through a nice nutty flavor, and sharp bite. Do as you wish - melted or not melted - this sandwich is still delicious. Toast bread, smear with pesto and top with cheddar. In the past, I've never been afraid to admit that I take shortcuts in the kitchen from time to time. In fact, for the everyday guy or gal that finds cooking to be troublesome, I actually encourage the semi-homemade approach. Of course, I say that full and well knowing that the Sandra Lee jokes will soon start to follow. 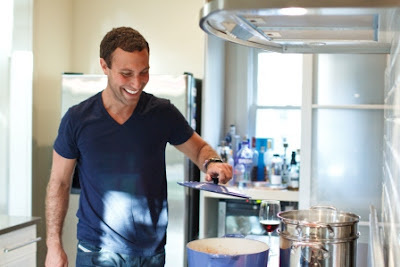 More or less, what I'm trying to say is that you don't always have to make everything from scratch to pull off an outstanding, healthy meal at home. Take this recipe as an example. I often find inspiration while walking the aisles of the grocery store - surveying what's on sale, what looks good, etc. as a guide to my nightly meal. Whole Foods had some fresh GA shrimp on sale, so that was my starting point. The unseasonably warm weather also had my mind focused on bright, fresh flavors. But alas, my basil plant has yet to sprout, and purchasing enough of those $2.99 packets of fresh basil to make my own pesto would have been, well - unreasonable. So I took a shortcut by picking up a freshly prepared jar of basil in the refrigerated section at the store. Don't get me wrong - I'd always prefer to make my own pesto, assuming I have the ingredients on hand - fresh basil, toasted pine nuts, Parmigiano Reggiano cheese, and EVOO. It's quite simple actually. But without these ingredients on hand, it can be pretty expensive. Better yet - the store-bought pesto turned out to be pretty darn good. So, the next time you are thinking about hitting up the drive through or giving in to an expensive restaurant meal, think about taking a shortcut AT HOME. It's cheaper, healthier, and more satisfying than letting someone else do all the work. Even if you did 'cheat' - just a little. This is a first for me - uploading a video directly onto my site. Perhaps I should 'get with the times' eh? Anyways, I just recently came across this outstanding video produced by my friends up in PEI featuring highlights from the Fall Flavours Festival I participated in last September. Celeb chefs like Curtis Stone, Mark McEwan, Lynn Crawford, and . . . me? Pretty cool. Please note - I was pretty hungover during my 'interview'. Too many Island Reds the night before. Not to mention the fact that I had just broken into 'Sim's Steakhouse' only moments before; setting off all the alarms and having the police come chase down a foreigner who was simply trying to meet up with Chef Ross to do prep work in the kitchen. Quite frankly - I'm pretty sure Ross set me up just to see my reaction on the security camera when the alarms sounded. What a way to wake up. That's it - hope you all are having a great Tuesday! 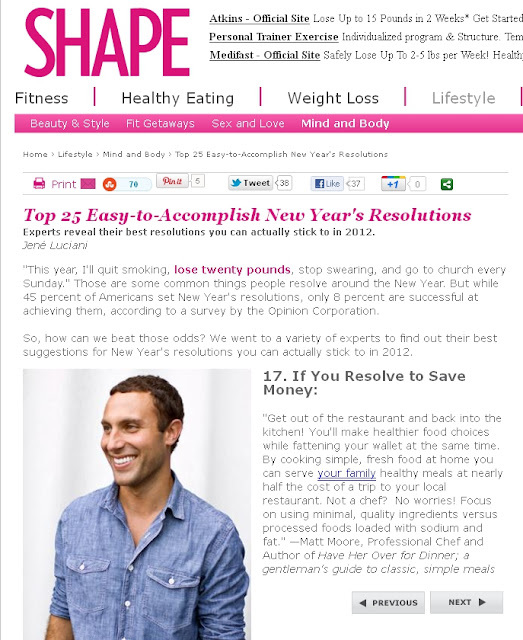 Check out yours truly sharing ways to stay thin while cooking at home! 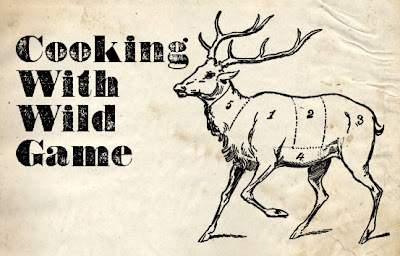 My post on "Cooking with Wild Game" came out just a few days ago from my friends over at The Art of Manliness. For full text, pictures, and recipes - please give them a visit here. In the meantime - get out into the great outdoors - trust me, it TASTES good! It's been a busy month or so . . . however I've still got nothing to show for it. In times like these I feel like a kid piling up rocks and placing them in a wagon only to take them to the market at a later date. Well, my wagon is getting pretty full. I imagine most of us feel like that from time to time. The salesman that builds a list of leads, sometimes waiting months or even years to see the fruits of his labor finally 'close'. Even as parents, you fight some hard lessons with your kids because you know in the future - those tough lessons will pay off when it comes to their decision making and choices. Anyways - I realize I'm starting to sound pretty dramatic. My WIP's (works in progress) have been much more subtle as of late. Whether its drafting new recipes, writing freelance articles, polishing some book proposals, pitching to television networks, or even giving you a glimpse of the prototype for the next release (Moonshine Soap) from my company EastWest Bottler's, I'm beginning to feel that it's time to take things to the market. In the coming months, you'll hopefully begin seeing some of the things I've mentioned making their way out to the masses. With your support, and a little luck these works in progress will become successes. And for a guy who talks a lot a bout food - nothing tastes better than success. So, what are your works in progress?